It was the end of November when I sent an email home to my core family members saying I may end the trip early, citing being over “living out of ziploc bags and a suitcase” alongside my desire to “set up my own place again, have stability, and sleep in the same bed for two weeks in a row!” I was considering cutting my Africa travels short to fast forward to India and the Big Shared World finish line. It was fitting to me that at the end of this global journey, one that I’d like to think has made me a better individual in the process, it was my brother who had become my source of energy to finish strong. Continuing my journey in Kenya after hundreds of responses to the BSW questions, I had my first answer that truly shocked me. To the question “what does a good life mean to you?,” a bright eyed young woman answered that her life had been full of difficulties making her not actually know what a good life means. 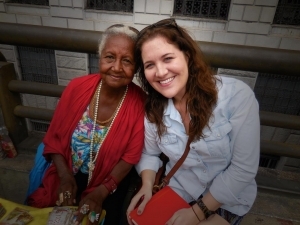 After finishing the other questions and turning to a more casual conversation, she stunned me again as she asked what my answer to the question about a good life was so that she could have something to strive for. As if that wasn’t profound enough for a reason to have kept going, it was also in Kenya where I reconnected with a colleague who spends time between Nairobi and Washington DC. Just as I thought heading home would help satisfy my craving for future stability, we spent time in Africa discussing ways we can work together in the future. And when I go to DC this coming week to find a new place, I have a full day meeting for a project we’ll be collaborating on. Highly doubtful that all would have transpired had I not kept going. Alongside encouragement to keep traveling, my brother’s email finished with some wise foresight of what I faced when I return to the “real world” that my BSW journey had arguably taken me away from. This reality is one with fast paced expectations, constant updates, and rewards for the most cleverly curated content, where significance and substance are often treated with less interest than the trivial and topical which is easy to like and share. As my brother’s email supportively reminded me of all the immediate pressures of the world I would return to upon arrival back home, it gave me the foresight to begin making a list of goals for the new life I would like to establish upon my return to “reality” after being away. While certainly I have seen and experienced cultures that have vastly different values than those in my home country, many of which I relate to much more than the ones under which I was raised, I still desire to not only live within the one I come from, but thrive here. For me, the new year’s biggest challenge will be to consistently incorporate all the beautiful lessons I have learned while away as I establish my new life back home. 1. Create a home conducive to hosting friends and family. I have always loved to have a home where people feel comfortable coming to. As I look at places to live in Washington DC, I don’t just think about if I can live there, but if it’s a place I’d see a friend sharing a coffee on my couch, or enough space to host a couple friends passing through town. I have a lot of favors to return when it comes to crashing on a couch! It’s not just important for me to eat healthier, but to learn more about food through cooking and all the benefits of certain spices and flavors. As well, to develop a comfort in the kitchen where I can really enjoy preparing meals for friends and family. In Thailand I took a cooking class where I learned to make a Thai chicken basil stir fry that has already become a family favorite! The joy of serving this to rave reviews has been an awesome feeling to experience. 3. Really enjoy the moments with the people in front of me. While traveling, I was in a different time zone from home most days, and people didn’t expect an instant response from me. I learned to put my phone away. Most of the notifications don’t actually matter, and true friends don’t seem to mind a little delayed reply, especially when my communication is more focused as I try to give everyone my actual attention when with them. Now that I’m back in the US, one of the most annoying things to me is being with my friends I haven’t seen in months, and having their phones on the table, checking it while we talk, letting other people come into our time together. My phone now remains in my purse as much as possible! 4. Stay genuinely connected with people I’ve met. Thanks to Skype, Facebook, Whatsapp, email, and a million other ways, I look forward to having more time to reconnect with all the amazing people who have made the BSW journey so incredible and rich for me. Now that I will have a permanent address for a bit, I’d like to establish a permanent connection to the community I live in through service. 6. Establish physically healthy routines. Of course every New Year goals list has to include to workout more, but I also mean to walk a mile instead of calling an uber and getting a bike when I move to DC for the longer distances. I specifically remember the feeling of health in Copenhagen with all the bike lanes and bike baskets full of people’s daily needs. While I could definitely use some more dedicated workouts, an overall healthy lifestyle is most important to me. 7. Buy a real alarm clock. The bigger goal is to establish more healthy and routine sleep habits. At a retreat in Bali, we were constantly told of how bad the light in technology is for restfulness at night. Using a phone as an alarm clock makes it easy to also use it as an end of day sleep distraction, and beginning of day wake up procrastination. For tips, sleep advocate Arianna Huffington has dedicated a webpage of sleep and wellness content to learn from. 8. Grow spirituality and learn about faiths that help others on this path. I started the BSW journey a pretty comfortable atheist/agnostic, and have happily ended more spiritually open and curious. While I am in no way trying to ascribe my beliefs to an existing religion, I do look forward to learning more about all outlets people use to find purpose and meaning with their time on this planet. 9. Develop my hobbies! Do more random things to the fullest! I love people that are avid about their side interests. When I went to a writer’s conference this fall, I met people who are passionate closet authors. They go to their completely unrelated day job at 9 am, after waking up at 5 am to clock in several hours writing their sci-fi young adult romance novel. While I intend to make writing a major priority, I want to develop side hobbies that wake me up at 5 am to do before I write. Nearly any person that sold me something along the BSW journey will likely tell you that I enjoy a good bargain, from the process to the price! I am happy to see articles confirming my good decision to spend my own savings on experiences rather than things, but it’s important to be sure to get the most bang for your buck wherever possible so that you can experience as much as you can. Especially through international travel, you start to see the value of money in a whole new light. As I move back to the US where the most successful businesses are the ones who convince you of all your material needs, I hope to maintain healthy spending habits that allow for more life adventures to come where I can splurge on unique one-of-a-kind Moroccan rugs and Indian furniture instead of more mass produced things I really don’t need. 11. Use commute and waiting time productively. 12. Learn new ways to make life easier. This probably means that instead of writing journal entries in my notes section on my phone, emailing them to myself, then copy/pasting them into a word doc, I should probably just use evernote, google docs, and other more direct means of useful technology and apps to store my thoughts and information. 13. Write more thank you notes. Being gracious is actually good for YOU. And we all know it feels great to be appreciated and thanked for our efforts. So it’s a win-win to actively work at thanking more people. I’d like to make this a constant practice. I’m guilty of buying a lot of books on Amazon that make my shelf more sophisticated than my mind. Taking the time to actually read is something I want to establish in my life. Once I check off item #7, then I’ll incorporate Bill Gates’ daily practice of reading an hour every night before bed. 15. Share the Big Shared World experience. This blog marks the beginning of the new year and a more stable location environment than the last year which included over 40 countries. One of the hardest things for me was to allow myself to just be in the moment and remove the pressure to always share what I was doing in order to build a following. Now that I am home, I look forward to growing the existing platforms I have established for sharing, and increasing the BSW presence on sites like Facebook, Instagram, Twitter, and who knows what new mode of communication in the year to come! 16. Write a really awesome book! Last, but absolutely not least is to really spend time putting together a read that is worthy of the amazing story that the Big Shared World journey really was! 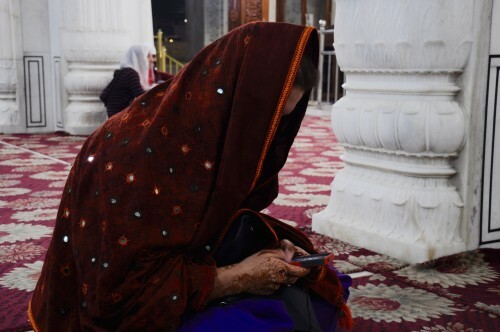 I love the photo above that my friend’s dad snapped of me at the Sikh religion’s most holy site, Harmandir Sahib or The Golden Temple, in Amritsar, India. While it appears I’m busy texting or Facebooking, this was me doing as I always did in moments of inspiration along the way – writing thoughts for my future book! !